Gulai Nangka (Jackfruit Curry) is usually cooked using unripe or young jackfruit. 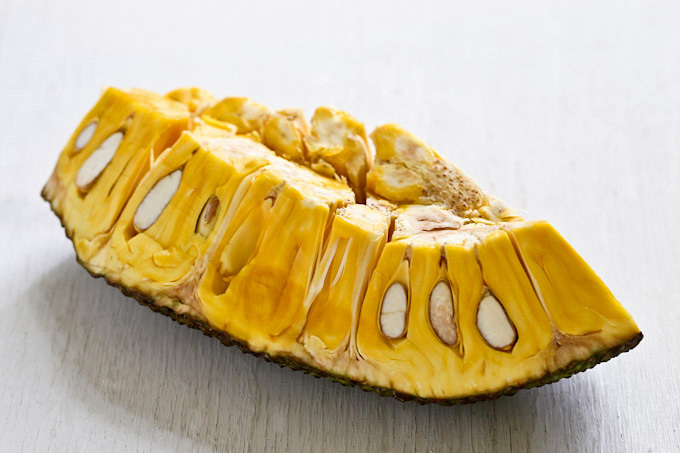 The entire unripe fruit including the flesh, seeds, and membrane is cut into small chunks and cooked. The outer thorny skin and core are removed. It is then cooked in a curry sauce until tender. 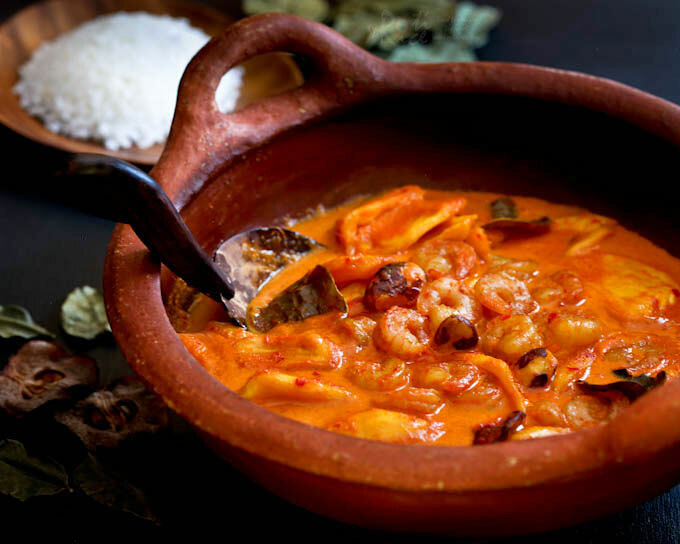 Today’s Jackfruit Shrimp Curry (Gulai Nangka Udang) is quite different from the Indian, Indonesian, and Thai versions out there. I used a portion of the ripe jackfruit I purchased at the Asian market recently in this light and flavorful curry. I used the same spice paste from my Chicken Curry with Kaffir Lime Leaves for the sauce which has a distinctive Nyonya flavor. I have to say I am very pleased with how the dish turned out. It was a little sweet, a little spicy, quite fragrant, and very delicious! 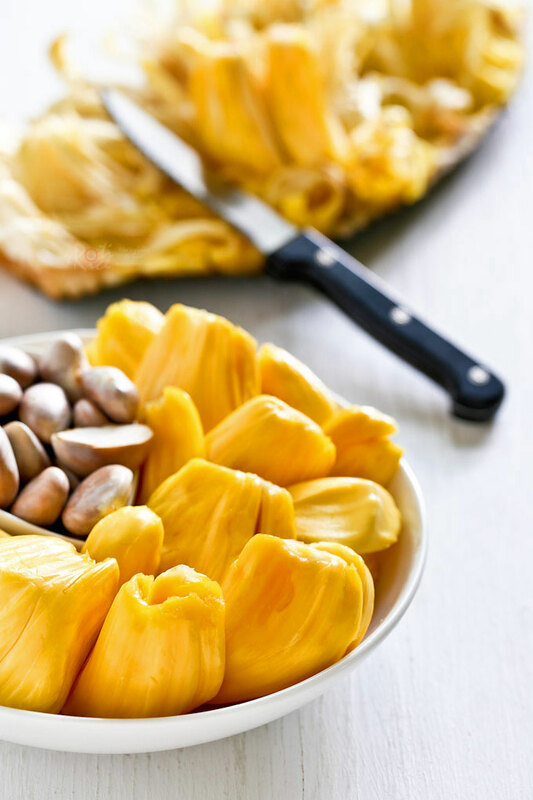 Did you know that jackfruit seeds are edible? They are actually quite tasty, similar in texture to that of boiled chestnuts. The preparation is very simple. Simply boil them in salt water for about 30 minutes or until soft. Peel off the outer waxy skin and eat as is or add them to curries. 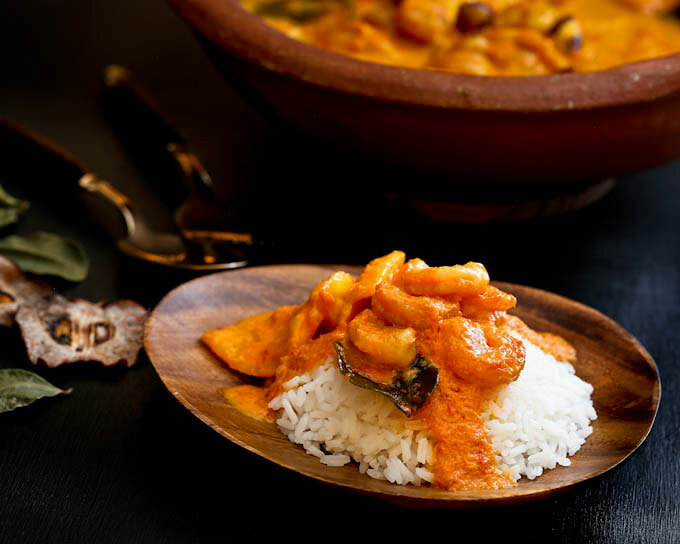 This Jackfruit Shrimp Curry (Gulai Nangka Udang) cooks really quickly. Do not overcook the jackfruit. It should still be quite firm after cooking. 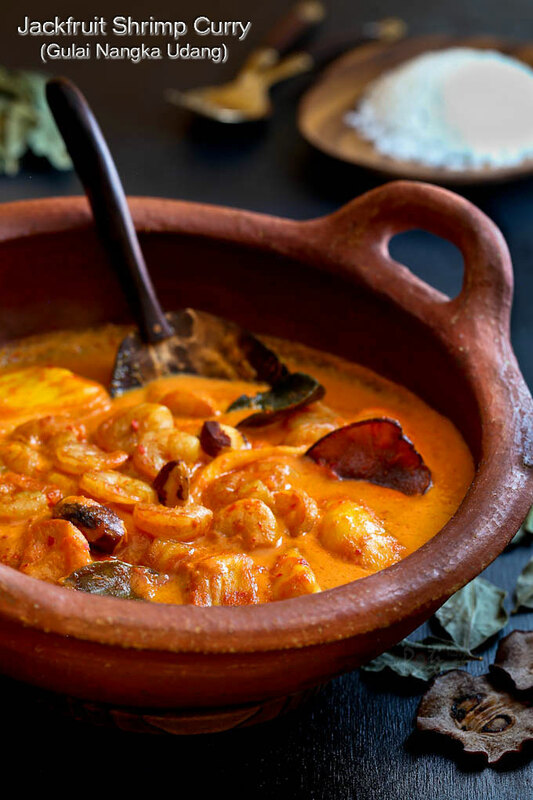 Jackfruit Shrimp Curry (Gulai Nangka Udang) - the combination of jackfruit and shrimps in this fragrant spicy sweet curry is a must try. It is so delicious! Grind spice paste ingredients in a blender or food processor with ¼ cup (60ml) water. Heat vegetable oil in a medium sized pot. Add spice paste and stir fry until fragrant, about 5 to 6 minutes. Pour in coconut milk. Add kaffir lime leaves and assam gelugor (if using). Cover and bring to a boil over medium heat. When sauce comes to a boil, add shrimps, jackfruit, cooked jackfruit seeds (if using) and salt. Simmer for 3 to 5 minutes. Shrimps should turn curl and jackfruit heated through. If you did not use assam gelugor, stir in lime juice now. 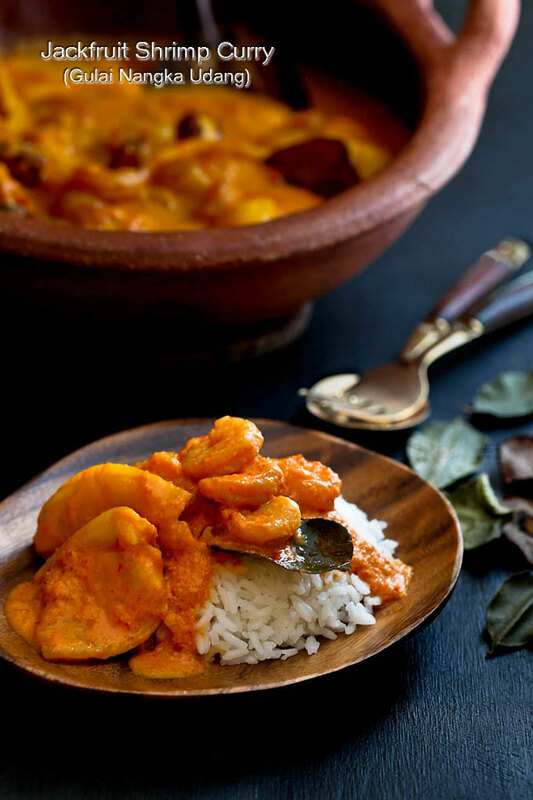 Always serve Jackfruit Shrimp Curry (Gulai Nangka Udang) with steamed rice and be sure to have lots of it on hand. Do give it a try. This looks insanely good! Love the idea of using sweet fruit in what’s traditionally thought of as savoury curry.